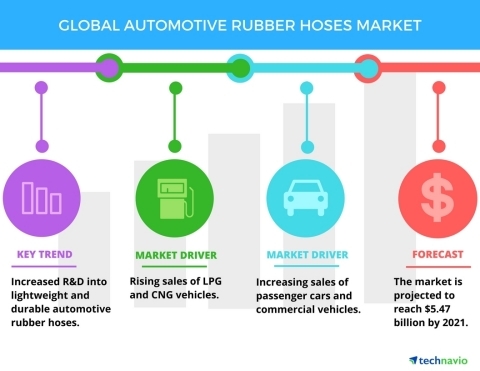 Technavio analysts forecast the global automotive rubber hoses market to grow at a CAGR of over 5% during the forecast period, according to their latest report. The research study covers the present scenario and growth prospects of the global automotive rubber hoses market for 2017-2021. Automotive rubber hoses consist of a unit series of hoses and pipes used within a vehicle's engine. Automotive hoses transfer engine fluids and gases and ensure proper functioning of the engine. Every automotive is equipped with a unit of rubber hoses that have unique functions. Automotive rubber hoses are basically hollow flexible tubes made to carry gases and fluids from one engine part to another. Apart from automotive rubber hoses, automotive pipes are also used for similar purposes. Automotive pipes are inflexible and are made of heat-resistant and high-pressure resistant. They are used for transferring fluids or gasses passing out of the engine after combustion. Hence, automotive pipes cannot be replaced with automotive hoses. Technological innovations with respect to finding newer methods of faster and efficient production are gaining importance in automotive industry. OEMs have been testing various new technologies for reducing material wastage without compromising on the quality of products. DuPont, an American manufacturer of automotive components, including automotive rubber hoses, has developed a manufacturing technique unique to the method of producing automotive hoses. Rising dissidence toward diesel vehicles due to their highly polluting nature and increasing stringency of emission regulations against vehicles operating on petroleum-based fuels are driving vehicle manufacturers to develop vehicles operating on alternative fuels, such as liquified petroleum gas (LPG) and compressed natural gas (CNG). “Automotive rubber hoses used in LPG and CNG vehicles need to be flexible in order to connect to the nozzles of auto gas injectors within the vehicle's fuel delivery systems. LPG would be in the vapor state and stored at a low pressure within the gas reservoir. The hoses used for fuel delivery in an LPG vehicle would be made specifically to enable effective and quick transfer of vaporized LPG to the combustion chamber,” adds Amey. Demand for automotive rubber hoses largely depends on sales of passenger cars and commercial vehicles. Majority of automotive manufacturers are focusing their vehicle production for markets in emerging economies, such as China, India, Brazil, and Mexico. Growing urbanization and increasing spending power of middle-income groups have led to an increased demand for automotive in emerging economies. Rising urbanization in developing nations, namely India, China, and Brazil, is driving the demand for commercial vehicles to meet the transportation requirements of the increased urban population. An acceptable amount of transportation services is essential to meet the mounting demands of the population in urban areas.